The people at Rational Responders.com want your soul! It is their mission in life to get as many individuals as possible to commit the ultimate sin, the unpardonable sin, blasphemy against the Holy Spirit. It is not enough that they have damned themselves by such an act, but, as misery loves company, they are determined to drag some down with them. By last count, there were 1289 video responses to their 'blasphemy challenge'. 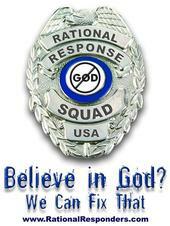 The first 1,001 responders were to receive a FREE DVD of the documentary, "The God who wasn't there". Those 1,001 misguided individuals have sold their souls for a mere $10.00 DVD. How sad for them, but it gets worse. There are 288 more lost souls who get nothing for their ignorance. It is really too late for those who have fallen for the lie that there is no God and have made an outright effort to blaspheme against the Holy Spirit. But it is not too late for those who might be considering it, but have not yet taken the challenge to heart. While you are doing some research (for the sake of your soul), take a look around this web site. I make no bones about calling out so-called Christians because of the damage that some of them do in the name of Christianity. They have given Christianity a bad name, but if you look carefully at Christianity itself, considering the message of our founder first (Jesus Christ), and considering the message of the Bible, a collection of 66 books that true Christians believe is the inerrant Word of God, you will find that many Christians do not portray Christianity as Jesus Christ intended. However, that should not deter anyone from becoming a Christian and living a life that God intended. I'm not asking you to even believe in Jesus, God, or the Bible, but for now, only to consider the content of the sources for the Christian faith. How does living according to the true Christian message harm anyone in any way? If you study honestly, you will find that the Christian way, as it is revealed to us by Jesus Christ of Nazareth, and as it is revealed to us in the Bible, is the most excellent way. Another thing I did on this web site is to show how simple Christianity is. Many churches have made Christianity out to be something that it is not. They have caused confusion and division (as you can see from all of the denominations). What I have attempted to do on these pages is to show the reader a very easy to understand, and more reasonable Biblically based Christianity. I have removed all of the man-made rules and regulations, rituals, rites, and all of the other fluff that church has become very well known for. I realize there is a lot of reading involved here. I have spent years going over this information for my own knowledge and benefit. I don't expect it will take you any less time. I'm not willing to debate you. I have presented some very important information here that is not debatable. It is your choice to take a look at it or not. I'm simply making it available to you. If your intention was to take the Rational Responders challenge to blaspheme the Holy Spirit but changed your mind as a result of this website, please let me know.